Patty Winter's Walt Disney World 2006 Trip--"Surveying the World"
What is it like to turn 47 square miles of swampland into the world's most popular family vacation destination? The people who performed the initial surveying of Walt Disney World in the 1960s were indispensable participants in that endeavor. Today, the WDW surveying department carries on their tradition as theme parks, hotels, and other structures are built or modified. 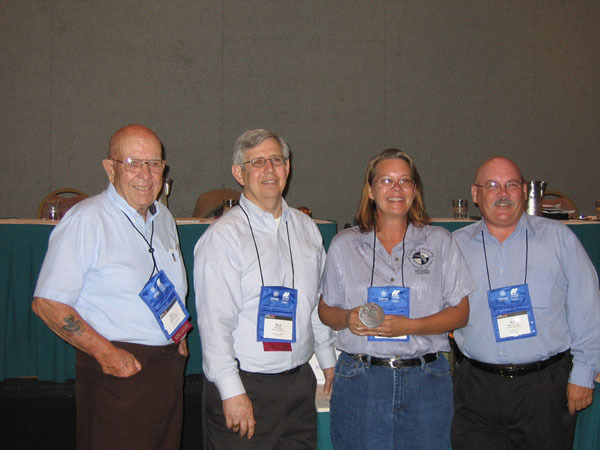 The 2006 annual conference of the American Congress on Surveying and Mapping (ACSM) was held in Orlando, Florida, providing a perfect opportunity for a talk about surveying at WDW. On April 25, both the original and current chief surveyors of Walt Disney World gave a presentation about their experiences. John Hohol, chair of the ACSM's conference planning committee, knew about my interest in Disney benchmarks, and generously invited my fellow benchmark hunter Nick Enicks and me to hear them speak. Here's a summary of the event. Nick and I arrived at the Caribe Royale hotel about half an hour before the session was due to begin. We introduced ourselves to the speakers and then browsed the maps and photos that had been pinned to a wall of the meeting room. We also looked at several sample Disney benchmarks (from both Disney World and Disneyland) that John Hohol had brought with him. John worked for many years for survey disk manufacturer Berntsen International (the largest manufacturer of survey markers in the U.S.). 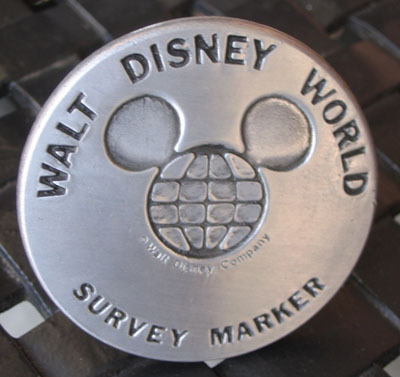 It was John who first convinced Disney surveyors to start installing decorative survey disks at Disney properties. Until then, they had been using simple survey nails, scribed Xs, etc. 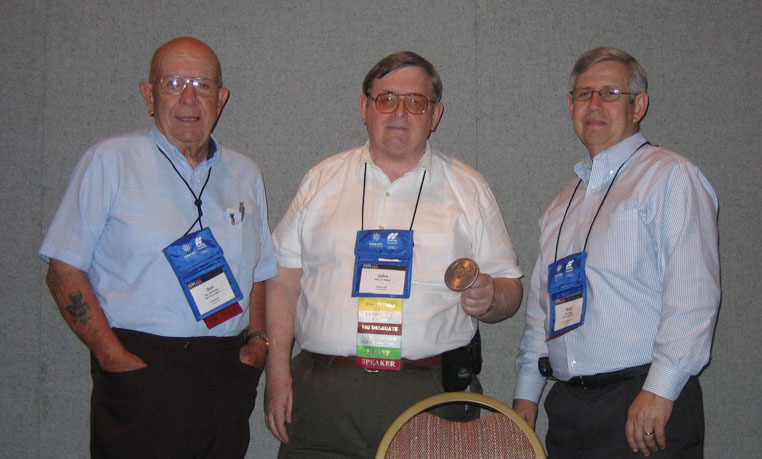 To begin the session, John introduced the current chief surveyor of Walt Disney World, Bud Joiner, and Bud's predecessor--the first chief surveyor of WDW--Don McKinney. Bud took the first shift, beginning with the now-familiar story of how, in the 1960s, Walt Disney went looking for a large tract of undeveloped property on which he could build an East Coast version of Disneyland with room to grow and complete control over the area adjoining the theme parks. Walt was flying over central Florida when he spotted a 400-acre lake with a 12-acre island and reportedly said, "That's my Tom Sawyer Island." Bev and Bill Hart, Jr. with their father's geodimeter. Both of them are also surveyors. Most Florida development at that time was on the coasts; no one really considered the Orlando area good for anything except citrus groves. So when a stranger walked into surveyor Bill Hart's Orlando office one day in 1964 and said he had thousands of acres he needed surveyed right away, Hart was wary. Land speculation was rife in Florida, and surveyors often didn't get paid when a speculation deal went bad. Hart prepared a proposal for surveying the stranger's land, but protected himself by asking for a $10,000 retainer, and telling the man that if he and his crew didn't get paid within five days after starting, they'd walk off the job. Thinking that he would never see the man again, Bill Hart went back to work on a job on the Florida/Georgia border. Before he left, he mentioned to his wife Judy (who was also the office manager) that if by some chance the job came through, he'd need a geodimeter [an instrument that uses light waves to provide highly accurate distance measurements]. (Photo courtesy Bill Hart, Jr.
Much to Judy's surprise, the next day the man returned with a cashier's check for $10,000. That was a Friday, and he said he expected to see a crew on-site on Monday. When Bill returned a couple of days later, he swung by the office before returning home and saw a geodimeter sitting on the floor, along with a note from Judy on the blackboard: "Geodimeter training Monday 8:00 a.m." Bill and his crew were off and running! It wasn't until much later that he finally discovered that the real owner of the land was Walt Disney. 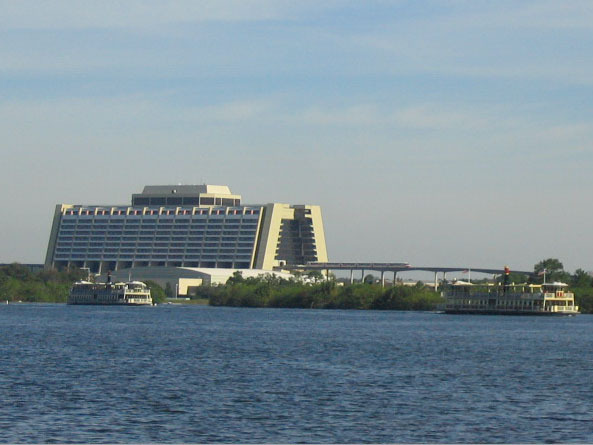 In that photo, the land that would become Walt Disney World looked brushy but tolerable. The next photo gave a better idea of what the surveyors faced in large parts of the tract. 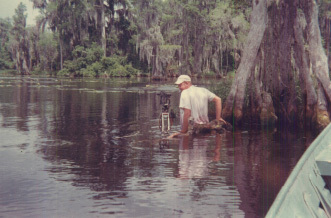 It showed surveyor Gus Hart (Bill's brother) standing hip-deep in a swamp with his surveying equipment. Bud mentioned several times during the presentation how accurate Hart's survey was, and noted, "He did a beautiful job...We still use it every day." Bud also told how Bill established the initial reference points for his survey. "Since it was extremely remote--and I don't know how to emphasize that enough: the land itself was all woods, and everything surrounding was woods for many, many miles--in order to come up with a basis of bearings [the starting point for all the directional bearings recorded in a survey], he did a solar observation on Christmas Eve, 1964." Bill also established a Cartesian coordinate system for the property that is still used today. After showing a few other early photos of WDW construction, Bud introduced Don McKinney. In the early 1950s, Don was a contract surveyor in California, and he worked on the initial construction of Disneyland. In 1969, he was hired to become Walt Disney World's first chief surveyor. Don began with a photo of a surveyor holding a machete, then went to another one that featured a 15-foot alligator. It quickly became apparent to those of us in the audience that hip-deep swamps weren't the only challenge in building Walt Disney World. But alligators were only one reason why survey crews might have kept machetes at hand. Don related a story about something that happened to one of Bill Hart's crews as they were working in the southern part of the WDW property. Because the area was so remote, and therefore time consuming to get into and out of, the survey crew would usually skip their lunch break, then make up the time by stopping work early. But one day, they worked all the way until dusk. As they were walking out through the swamp, they began hearing strange sounds. Plop...plop...plop...plop... The surveyors eventually realized that they were hearing cottonmouth snakes rolling off the banks and into the water. Ahead of them, before they could reach dry land, was nearly a mile of swamp. The crew chief said it was the longest mile of his entire life. But luckily, everyone made it back safely. Don punctuated that story by bringing up a photo of a surveyor holding a dead cottonmouth snake about 7 or 8 ft. long. The surveyor had killed the snake with a machete as it attacked him in what is now the middle of Disney-MGM Studios. And you thought the Twilight Zone Tower of Terror was scary! 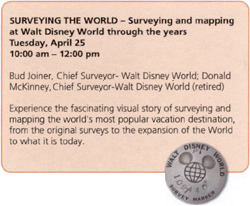 As mentioned, Don McKinney was hired as Walt Disney World's first chief surveyor in 1969. 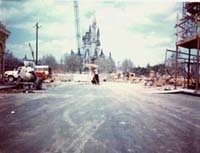 WDW was the biggest private construction project in the world at that time, and Don figured they'd need 10 to 12 crews. He actually ended up with 21 in-house crews, plus 3 or 4 contract crews. It's amazing that Don and his assistants were able to pull off such a huge task, because he mentioned that they couldn't find enough experienced surveyors in Orlando and so had to train the crews themselves. Aside from staffing problems, snakes continued to be a huge issue during the initial surveying for WDW. Not just cottonmouths, but also rattlers. Don's office ended up issuing gun permits to the survey crew chiefs, and all of them began wearing sidearms. That decision had some interesting consequences. One time, Don got a call from Pinkerton (Disney World's security company at the time) asking what was going on at the building site for the Palm golf course. The Pinkerton guys said it sounded like World War III. It turned out that a surveyor named Tom had had to kill a 7-foot rattler just after the job started, and he'd been very skittish ever since. Apparently the golf course area had plenty of things that looked like snakes, and Tom was shooting at all of them, just in case. Don decided he should transfer Tom to a less stressful job. Several years later, when Disney wanted to add a Pirates of the Caribbean ride to the Magic Kingdom, they contacted the survey department to map the topography of the site. Don assigned Tom to the job. Not long after, Don got a phone call from the project supervisor asking him to come out to the site. When Don arrived to see what the problem was, he discovered that Tom had encountered a nest of cottonmouths and was refusing to continue his work. Tom said, adamantly, "Boss, you can fire me if you want to, but I'm not goin' back in there!" After showing a couple more photos of the Magic Kingdom, Don brought up a June 1971 picture of a roughly triangular-shaped steel structure that was instantly recognizable to anyone who's visited Disney World. "This is the Contemporary hotel, which reminds me of another snake story..."
It seems that about the time they'd gotten the pilings in for the hotel, the snake problem was so bad that the project supervisors had a meeting to discuss what to do. They talked about putting up a fence to keep the snakes out. Roy Disney was at the meeting and said, "Don't forget, what you fence out, you're also going to fence in." So they decided to abandon the fence idea. "But," as Don noted drily, "as it turned out, with all the construction and activity, the snakes basically left the area and went back out in the woods--where the surveyors were." Big laugh from the audience at that remark! Some of the surveying jobs at Walt Disney World have been truly unique. It seems that Disney calls on them whenever the company needs any sort of position measuring. 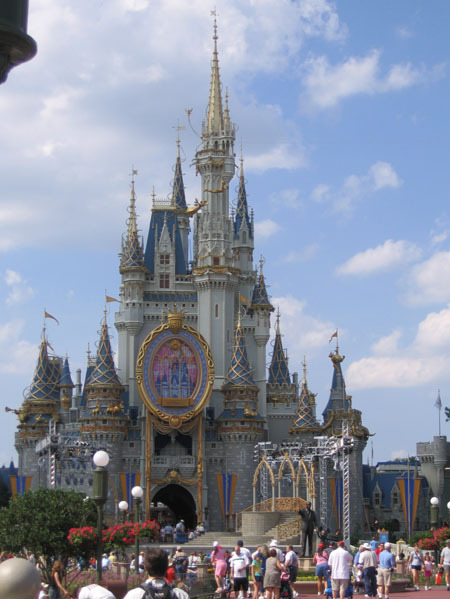 For example, Don's surveyors determined the proper layout of the walls and other interior features of Cinderella Castle, until they trained some carpenters to do it. The surveyors also helped ascertain the proper placement of the major branches of the fake tree holding the Swiss Family Treehouse. As Don noted, "If there was any kind of a problem, [their attitude was] just give it to the surveyors--they can figure it out!" Then there was the Disney World monorail. Don said the monorail would have been a piece of cake with today's surveying equipment, but in the late 1960s, the situation was very different. Laying out the footings (the concrete pads) was no problem, but the positioning of the piers (the upright supports for the track) had to be done very precisely. There wasn't any room for error, or the pieces of monorail track wouldn't drop into the piers and line up properly. After a few more photos, Don told the story of how a young draftsman from Titusville kept bugging him about joining the Disney survey department. Don finally hired the pesky draftsman in 1978. And now, Bud Joiner is the chief surveyor of Walt Disney World! Bud returned to the podium and picked up the story before opening day of Walt Disney World in 1971. 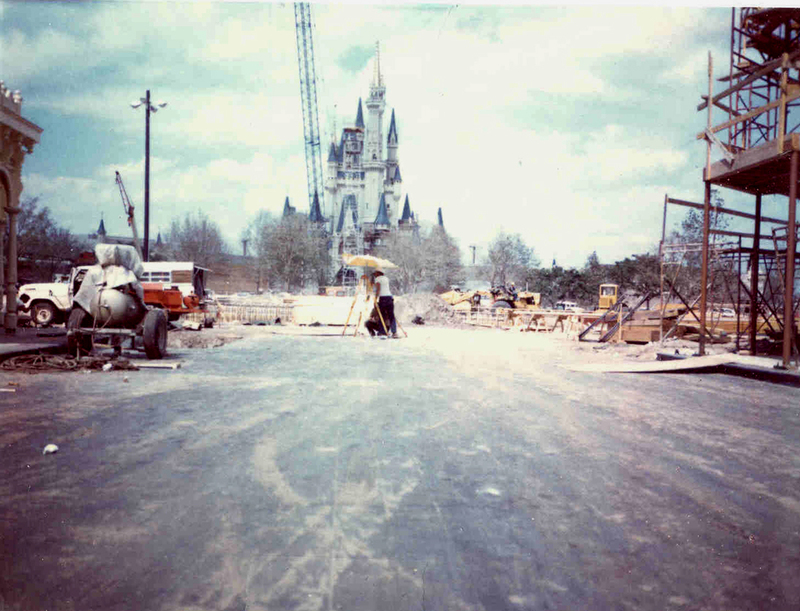 Here's a photo (probably taken in early 1971) of surveyor Matt Sheridan working on Main Street at the Magic Kingdom. As you can see, the buildings on one side of Main Street have their exteriors already, while those on the other side don't. 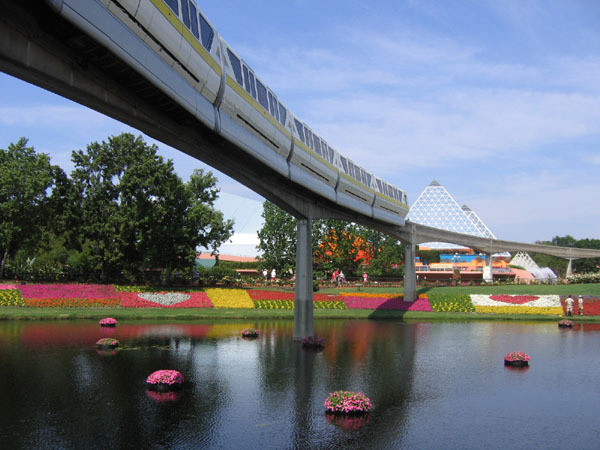 Bud came on board in time to help build Disney World's second theme park, Epcot. The biggest challenge there was the lake (now known as World Showcase Lagoon). They had a terrible time finding solid earth under the lake on which to build, such as for the walkways around World Showcase and the footings for the monorail. After probing down to about 20 feet with rods, they brought in equipment that could measure down much further. Even at about 180 feet, the muck was still 80% water. They finally settled on a sequence of dredging (during which they moved four million cubic yards of dirt), pumping out some of the water, putting in 20 feet of compacted fill, and then removing that to leave a sandy bottom. 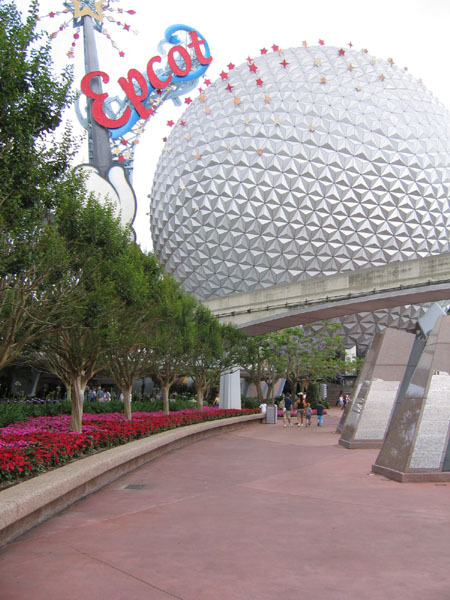 Also, all of Epcot had to be shifted about 500 feet west of the location originally planned to avoid disrupting the habitat of some red-cockaded woodpeckers, which are a federally recognized endangered species. As Don had mentioned earlier, the monorail projects were incredibly complicated. Bud worked on the Epcot monorail for almost two and a half years, performing the layout calculations. At lunch after this presentation, Bud said that one time he literally had a nightmare about those calculations. He dreamed that they were laying the first piece of track and it fell to the ground because there was too much space between the piers. Luckily, that was only a dream, and the real monorail tracks went in just fine! After showing various photos of the Epcot monorail line construction and the topping out (final panel) of the Spaceship Earth dome, Bud put up a slide summarizing some of the many projects that the Disney World surveyors have worked on since Epcot originally opened. They include the Living Seas, Horizons, and Honey, I Shrunk the Audience buildings; the Norway, China, and Moroccopavilions; a laser light show (perhaps IllumiNations? ); and the Test Track, Mission: Space, and Soarin' rides. A photo of the construction of the Swan and Dolphin hotels in 1988 came with a story about how the surveyors had to redo the plat [site plan] for these hotels 18 times--including the night before Disney closed the $400 million deal with the hotels' owners. That was the night of a big party for Bud's 10th anniversary with Disney. He attended the dinner, but then took his wife home, went back to the office, and worked all night to finish the plat revision in time for the big meeting in New York he next day. 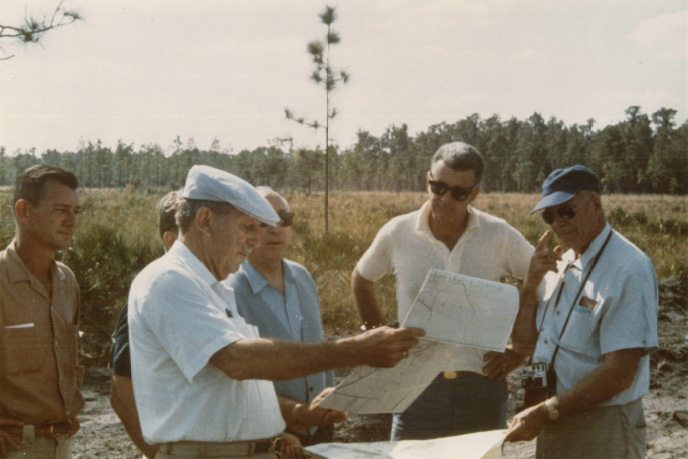 After photos and brief mentions of the Disney Vacation Club (Disney's timeshare program, which began with the Old Key West resort) and the Disney Wilderness Preserve (8,500 acres about 15 miles south of WDW), Bud showed a map of the Disney World survey control network. It has more than 10,000 control points. And those are just the exterior controls! During the renovation of Pirates of the Caribbean in early 2006, workers uncovered a number of old interior control points when they pulled off drywall. 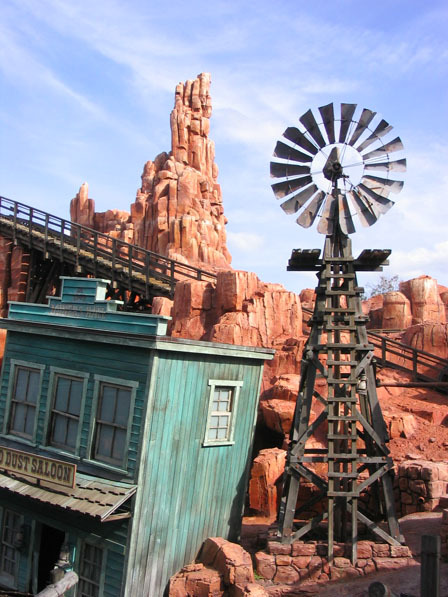 Of course, the Disney World surveyors are keeping on top of the latest surveying technologies. 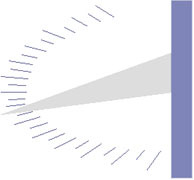 They have an ongoing GPS densification project (placing new survey control points with the accuracy now available from the Global Positioning System). And their extensive GIS (geographic information system) database includes the locations of all roadway signage, utilities, etc. throughout the WDW property. To demonstrate some of the sophisticated stuff they're doing these days, Bud showed a laser scan of part of the interior portion of Big Thunder Mountain Railroad. He noted that, "You can generate a readable centerline from this data and come up with ride geometry." In addition to the wealth of new digital data they're collecting, they're also digitizing their old written information, including scanning all 100,000-plus pages of field notes. As I mentioned earlier, the Disney surveyors are called on to perform tasks that I'm sure surveyors for, say, Caltrans would never imagine. At this point in the presentation, Bud displayed a list of some of these. They included mapping the conditions under water for ferryboat landings, fixing the vertical and horizontal locations of aircraft flying over WDW, determining the trajectory of lasers used in an outdoor light show, mapping the route of the Kilimanjaro Safaris ride at Animal Kingdom ("It's kind of spooky out there at night. You're out there with flashlights and all of a sudden a herd of gazelle go by. "), and checking the route and vertical clearance for moving a 100-year-old oak tree. Oh, and I can't forget to mention that sometimes the survey folks take a turn in the parks playing Disney characters! For example, Bud portrayed Pluto for a while. Bud finished up with a photo of the latest big project at WDW, the Expedition Everest ride at Animal Kingdom. He also very kindly mentioned my Disney benchmarks web site. The final part of the presentation was a question-and-answer period. I'll just synopsize a few segments here. Q: Were any of the surveyors ever attacked by the alligators or cottonmouths? A: Luckily, no. There was one incident with a scorpion, and gators have sometimes run people off the job, but there were no actual gator or snake injuries. Q: Where did all the landfill come from? A: Some came from a remote area in the northwest part of the property. 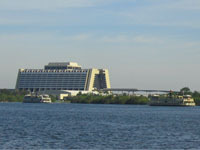 But also from Seven Seas Lagoon. That's a manmade feature, and they took out 8 million cubic yards of material to create it. They used that material to build the Magic Kingdom, which is 14 feet above natural ground. Under that raised level are the utilities and employee areas needed to run the park. Also, they removed 14 feet of muck in Bay Lake, revealing its beautiful white sandy bottom (which, however, has since eroded). Q: Have you used the top of Cinderella Castle or any of the mountains as intersection stations? Q: Yes, the flag atop the castle was used as a triangulation station for many years. Don: "It was wonderful because no matter where you were, always had a backsight [a point of known elevation] back there." Don then offered the following recollection. "There's one more little job that we didn't mention here that kind of made us scratch our heads. The company came to us and said, 'We don't think we're getting the height off our fireworks that we're paying for, and we want you guys to come out here and measure it.'" As people in the audience got looks of "huh? ?," Don said, "That was exactly my expression!" He explained, "What we did, we triangulated a point up on top of the Contemporary hotel. We had two theodolites up there, with two of our best instrument men, and then we got the audio/video people up there with us." The AV folks took video of the fireworks, and whenever the survey crew said, "Got it! That one!" they made a note about that burst. The crews kept videotaping and taking measurements until they figured they had recorded enough fireworks for their purposes. Later, they superimposed the heights calculated by the surveyors onto the images of the fireworks exploding over the Magic Kingdom. Don said, "It worked like a charm. It wasn't easy, but it was very, very accurate." Q: So any time a new ride or anything comes in, you guys have to lay it out? A: Don: "We don't lay it out for them. We give them a map they can design off of. A case in point would be one of the last ones I did before I retired. It was Spaceship Earth. They wanted to change it, and all the little scenes that you see in there, they all had to be mapped. Well, this had to be done when the ride was inactive, so that meant we were out there in the middle of the night. Another one that comes to mind is Tomorrowland in the Magic Kingdom. They wanted a complete map of that. We did that at night, too." Beverly Hart, and Bill Hart, Jr.
Q: How large is your current organization, and what kind of equipment are you using? A: Currently, there are about 20-21 people in the survey department. They have a GPS base station, some theodolites, ESRI software for GIS, AutoCad. They're also responsible for doing utility locates; they do about 1,800 of those a year. 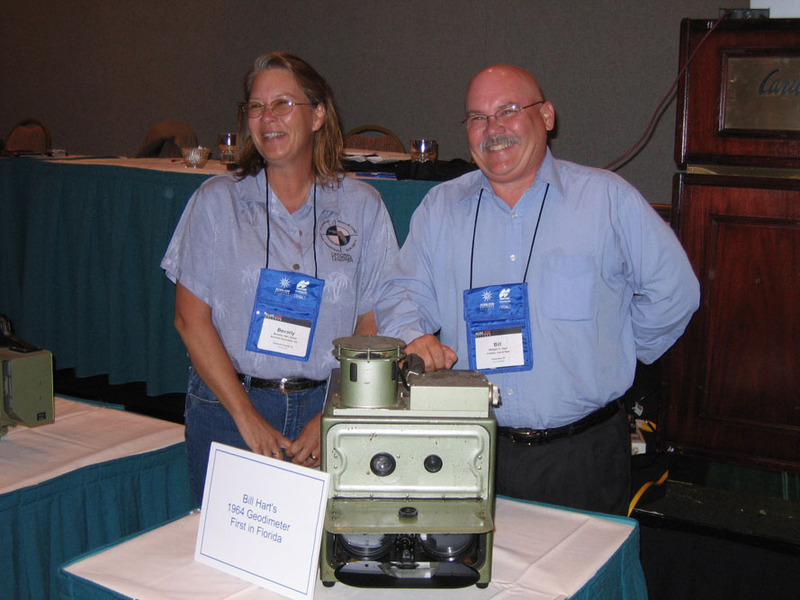 Bud also thanked Beverly and Bill Hart, Jr. for bringing in Bill Hart's original geodimeter. "He did such a beautiful job on that survey. I still don't know how he did it in the time frame he did. Particularly way down in the south property... I grew up in Florida and I've been in the woods all of my life; it's primeval down there." Don summed up his time at Walt Disney World this way: "You can see, being a surveyor at Disney is not really routine. I was sure glad to get out of there, I can tell you that. [audience laughter] Nah, I really loved the place. It's got a little spot in my heart. Those first three years I was here, I can honestly tell you, I never worked so hard--or had so much fun." to the ACSM for letting me use them here.